I'm so sorry but due to lack of bookings this event is cancelled – if you've booked you will be contacted shortly. Mike Brownlow – Multi-talented Mike Brownlow has been published many times, his latest book, with Simon Rickerty is Ten Little Monsters – following the success of Ten Little Pirates and Ten Little Princesses. Mike's books The Little Robots was turned into an animated TV series. Mike has won a number of awards and we're so excited to hear what he thinks about this year's #CKG shortlist. Catherine Johnson – I am so thrilled we'll be joined by Catherine, long listed for this year's Carnegie with the wonderful The Curious tale of the Lady Caraboo. Catherine has written some fabulous books – what will her take be on the shortlist? Elizabeth McDonald- I'm over the moon that Elizabeth has agreed to be on our panel. Elizabeth is works fro Wokingham libraries and has had many roles in the South East Libraries Group Comittee – and this is the second year she has been on the national judging panel of Carnegie/Greenaway. …if you're an author or an illustrator with your eye on the prize – just what is it they are looking for??? We have an actual judge who can tell you! 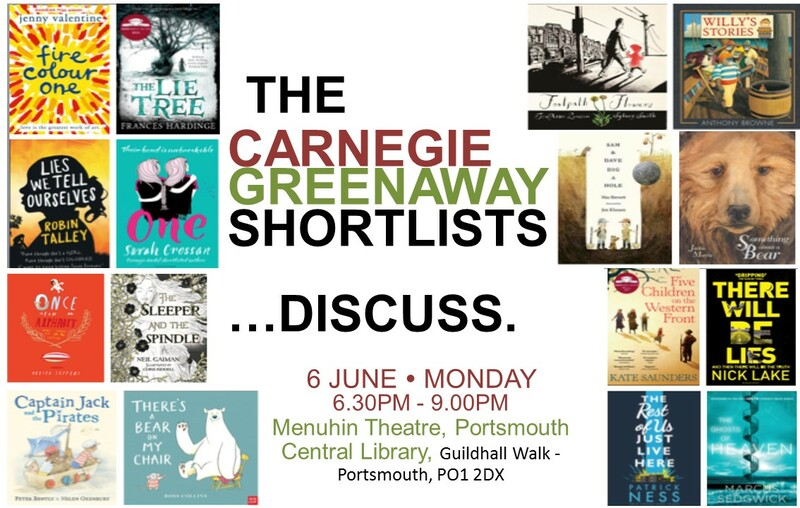 A number of SCBWI networks all over the UK will be holding similar events, so if you cannot make this Portsmouth event, look out for announcements local to you! We would love authors and illustrators to come and share their thoughts on the current list. But this event is also open to anybody interested in the world's top children's book awards. You might be a librarian, a bookseller, an editor, a publisher, an art director, or an author or illustrator at any stage of the journey to publication. You don't have to be a SCBWI member. 6.30 – 9.00 on Monday 6th June – this time might nudge towards 7 – please keep an eye on this site! This event is brought to you by SCBWI's Kathryn Evans, in conjunction with Portsmouth Writer's Hub's Tessa Ditner, and Portsmouth School's Library Service's David Percival. The small fee of £3 will go towards expenses. 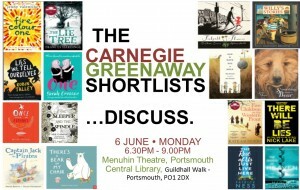 Because this is a joint event with Portsmouth Writer's Hub, non-members of SCBWI are listed at the same ticket price.